Welcome to episode 152 of the LJS Podcast where today we are covering my music theory checklist for understanding jazz improvisation. If you are wondering what step-by-step building blocks you need in place for understanding jazz harmony and improv, this is a solid list. Take notes on which ones you need to work on. Listen in! As a music educator and content creator, I spend a lot of my time trying to get into my student’s heads. I want to know their struggles, what they’re thinking, and what barriers they are hitting so I can help them better. Years ago I noticed that there will some students in my jazz practicing course that were getting left behind. There were some fundamentals that were missing. 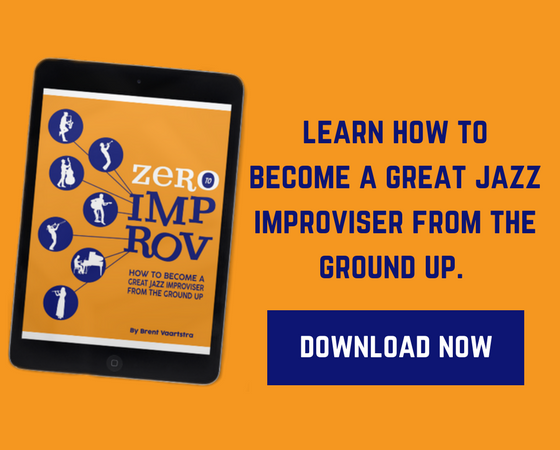 That ultimately lead to me writing my eBook and companion course Zero to Improv, which is a music theory-based approach to understanding jazz improvisation from the ground up. Today’s episode is a deep dive into my music theory checklist. These are things I discuss in my book, and I want you to take a look at this list to see where you fit in. 1. Scales- 3 elements of knowing and putting them to use. 2. Chords- The basic qualities, extensions, and alterations. 3. Scales and their relationships to chords- understanding how they connect. 4. Chord progressions- how to build them in major and minor keys, and which ones are important in jazz music. 5. Jazz standards- which ones to know and important song forms in jazz. 6. Conceptualizing jazz language- music theory approaches to understand what you are hearing. I want you to think critically about this list. Which areas do you need to work on? Are there any topics or concepts that you have no clue about? That’s okay. What’s important is that you take action. Learning how to play jazz, in my opinion, is a combination of aural learning and filling in the gaps with the theoretical. Make sure you understand the basics of jazz theory, and that element will surely set you up for success. Hi Brent, great podcast, I wish I had found your website when I was starting out at music college! Hi Jiri! Knowing all of the modes is ideal, but if we are thinking about a ii-V-I, realize all of the notes are still coming from the major scale. The ii chord would be Dorian, V chord Mixolydian, and the I chord Ionian. The only difference is which note you start on in the scale. Just be careful how you use scales to improvise. Focus on chord tones, and focus on learning and composing musical ideas over that chord progression. Thanks for the suggestion Jiri! Will add to requests list. When talking to students, you probably want to slow down a little. I think it would help you communicate more effectively. Thanks for the feedback, Mike! Certainly, don't want to be confusing. Just starting out and see that there is a lot to learn! The road goes on forever, and that's an essential part of the magic!